According to a research, people spend between one to three hours a day surfing the internet at work. Employees have been found doing all kinds of activities on the internet. From online shopping to paying bills, from reading the newspaper to replying back emails, employees spend quite a lot of time on the internet. For most of the employees, these are activities which do not take a lot of time. They can surf the internet during their lunch breaks. Sometimes, employees even look for new jobs at work. Employers have their own concerns due to which they block some websites which can stop the employees from wasting time on the internet. Providing the internet at work isn’t an option anymore, it has become a necessity. The usage of the internet depends entirely on the employees. They can even use for the good of the company. They can do research on how to be on top of the business. With the employees using the internet, which cannot be certain if they use it for personal reasons or for the benefit of the company, most of the employer’s feel a need to monitor the usage of internet. Monitoring employees can be beneficial for the employers but might result in demotivating the employees. The employee might feel insecure and threatened as they will get a feeling that the employer does not trusts them. In a recent audit conducted by the IT department, we have been notified that your usage of internet is quite high. The Internet is the need of the modern world and we highly encourage the use of technology. But using the internet other than work can be harmful to employee productivity. Also, using the internet besides work can increase the internet usage which can result in slowing down the internet speed and affect everyone’s work. 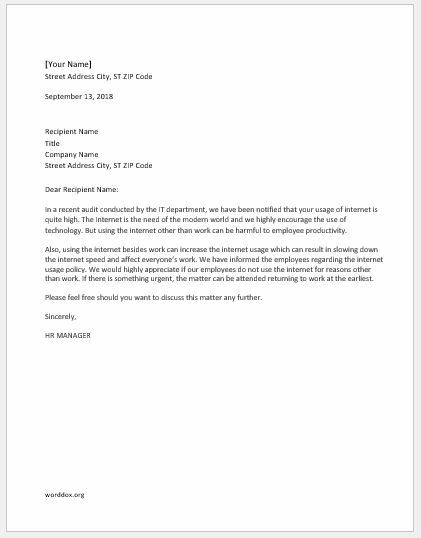 We have informed the employees regarding the internet usage policy. We would highly appreciate if our employees do not use the internet for reasons other than work. If there is something urgent, the matter can be attended returning to work at the earliest. Please feel free should you want to discuss this matter any further.